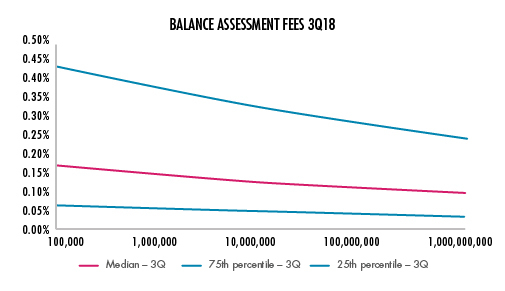 Earnings Credit Rates are the balance-based allowances banks give their corporate customers to offset fees on treasury management service fees. 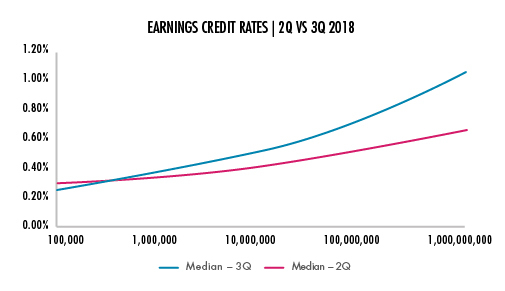 Rather than paying interest, banks have traditionally imputed an earnings credit for their customers. Customers benefit from lower net transaction banking fees. The banks benefit by attracting stable deposits and reporting wider interest rate spreads. During the second quarter, the Federal Reserve raised its target rate by 25 basis points (bps) to 2.00%. Our NDepth ECR Benchmarks between 2Q18 and 3Q18 show that ECRs at low balance levels did not move at all in response. However, at high balance levels, the increase was 27 bps, almost exactly matching the Fed increase, albeit from a substantially lower starting point. On DDA balances of $500,000, the median ECR was unchanged at 33 bps. On balances of $100,000,000, the median ECR increased 20 bps. On balances of $250,000,000, the median ECR increased 27 bps. ECRs vary widely, and not all corporate customers are treated equally. Proving that it pays to negotiate, customers received widely differing rates even at identical balance levels. On DDA balances of $100,000, the range of ECRs between the 25th and 75th percentiles was 28 bps. On balances of $100,000,000, the range widened to 71 bps. On balances of $250,000,000, the range between the 25th and 75th percentiles was an eye popping 91 bps. Money center banks vs. regionals. We saw diverging ECR strategies between the largest four U.S. banks and the regional banks. 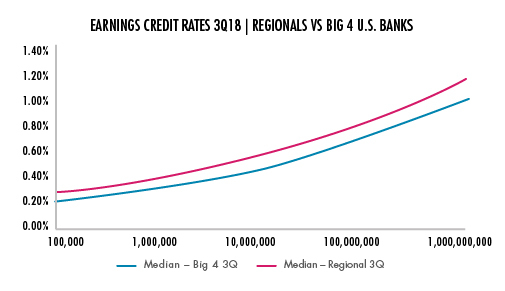 Unlike the second quarter in which the Big 4 money center banks (JPM, Citi, Wells and BofA) paid higher earnings credit rates for low balance customers than their regional counterparts, in the current quarter, regionals are paying higher ECRs than the Big 4 at all balance levels. On DDA balances of $100,000, regionals paid 7 bps more than the Big 4. On balances of $100,000,000, regionals paid 13 bps above the Big 4. On balances of $250,000,000, the spread between the regionals and money center banks was 14 bps. Balance Assessment Fees (BAF) are fees banks charge to corporate clients to recoup costs like FDIC insurance premiums and other regulatory-related items, banks now charge corporate customers. Unlike earnings credit rates, the fees are assessed against ledger balances rather than collected funds. Curiously, the FDIC deposit insurance covers only the first $250,000 in an account but the BAF is assessed on the entire ledger account balance (the ECR is paid only on collected balances.) NDepth benchmarks show the BAF declines slightly as balances rise. However, the net effective rate on actual collected balances has a fairly wide range as seen below. 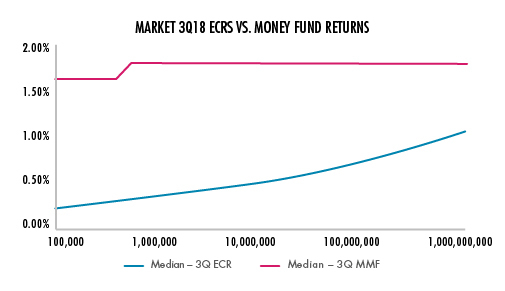 ECR vs. Money Market returns. In spite of the recent rise in earnings credit rates, they still lag money market rates. Many companies prefer the convenience of leaving funds in a bank deposit account and have the certainty that all balances will earn a return. Others prefer to actively manage excess cash directly. The chart below compares earnings credit rates with the average yield on institutional money market mutual funds. NDepth. Corporate treasurers and chief financial officers are using NDepth each month to manage their transaction banking fees and deposit balances. NDepth clients can upload and translate their voluminous account analysis statements, organize the information, reconcile variances, audit contract prices and compare against balance and service price benchmarks. 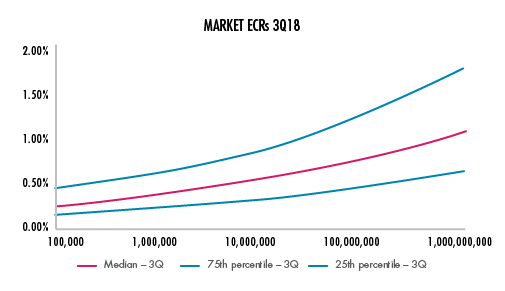 Insurance Company Earnings Credit Rates Lag Market — Although the ECRs for insurance, real estate and finance companies are about the ECR market average, they still are considerably lower that comparable money market rates, including rates on money market mutual funds.